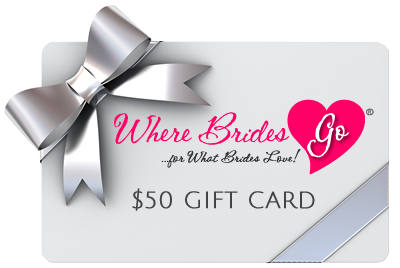 Enter to win a $50 gift card for WhereBridesGo.com! Complete the short form below and you'll be automatically entered to win a $50 gift card for WhereBridesGo.com and you can also receive information from certain wedding professionals (on this site only) offering services you are interested in. No spamming here - we don't sell our brides' information. We only provide it to the wedding professionals ON this site who offer the specific service or services you are requesting. That's how we roll! What can a $50 gift card get you? All kinds of wedding accessories from WhereBridesGo.com, incuding wedding favors, bridesmaid gifts, groomsman gifts, and so much more! WestPalmWeddings.com is a proud member of the WhereBridesGo.com network of wedding sites! Copyright 2000-2017. MSW Interactive Designs LLC DBA WhereBridesGo.com. We put the web to work for you!